London, British Museum, no. Pp. 2-119. Pen and ink and wash, heightened with white, over slight traces of black chalk, on light gray-green washed or prepared paper, 47.2 x 33.2; arched at the top and cut on all sides; the drawing is very badly rubbed, and many of the white highlights, especially above, have turned black; a piece missing and filled in at the lower left beneath the third caryatid; the arched area in the center has been cut out, filled, and given a greyish wash; laid down; wm, partially visible on the surface of the paper at the upper right, a quatrefoil probably framing some device that is not visible. Inscribed in a cartouche on Mariette’s mount: Rubeus / Florentinus. PROVENANCE: P.-J. Mariette (Lugt 1852: sale, Paris, 1775, lot 677); Robert Udny (Lugt 2248); E. Lelli? (Lugt 2852, Supplément); bequeathed to the museum in 1824 by Richard Payne Knight. Basan (Mariette sale), 1775, 104, under no. 677, as Rosso. Kusenberg, 1931, 137, 142, no. 50, Pl. LXXV, as Rosso, 1530-1540. Berenson, 1938, no. 2444B, as Rosso and as inspired by Michelangelo’s ideas for the tomb of Julius II. Popham, 1939, 29, as Rosso. Barocchi, 1950, 252, n. 9, Fig. 235, as too mediocre for Rosso. Blunt, 1953, 40, n. 27 (1973, 409, 32), as Rosso’s, based on the tomb of Julius II. Tolnay, IV, 1954, 107, as Rosso’s preparatory drawing for an engraving based on the Julius Tomb of 1516 or 1532. Carroll, 1964 (1976), I, Bk. I, 228-234, II, Bk. II, 360-367, D.38, Bk. III, Fig. 101, as a copy of a lost drawing of about 1532-1533; “Addition to the Preface,” 1976, vii, as autograph. Carroll, 1966, 170, 171, Fig. 4, 173-175, 179, as Rosso, done in France between late 1530 and late 1533. Eisler, 1969, 244, n. 162, 245, as by or after Rosso, and as probably dating from the 1530s. Zerner, in EdF, 1972, 247, under no. 279, and Fontainebleau, 1973, I, 77, under no. 279, mentions the drawing in relation to Alberti’s engraving of this composition. Béguin, “Maître Roux,” 1972, 102, as Rosso. urner, 1986, 150, no. 108, 151, Color Pl. Carroll, 1987, 10, 25-30, 41, 162-167, no. 55, with Fig., as Rosso, 1529, for an altar in S. Maria delle Lagrime in Arezzo. Béguin, 1988 (1989), 11, Fig. 5, 12, as Rosso, and of the French period. Carroll, 1989, 15-17, Fig. 30. Ciardi and Mugnaini, 1991, 150, as Rosso and as for the miraculous image of the Madonna delle Lagrime. Joukovsky, 1992, 132, 173, n. 1, accepted the French dating of this drawing in relation to the use of architecture and sculpture by Rosso in the Gallery of Francis I.
Franklin, 1994, 236, 252, Pl. 202, 253-255, 266, as by Rosso, as possibly for S. Maria delle Lagrime, the capitals of which are like those in the drawing, and for an altar some eight meters high; the seated figures presumably prophets in the context of the altar’s Marian imagery. This drawing is very closely related to an engraving by Cherubino Alberti inscribed: Rubeus / Florentinus / Inuentor and Cherubinus . Albertus .-/ Excussor / Romae- .1.5.7.5/ (Fig.E.4a). The print shows several additions, but where it coincides with the drawing it is of the same size and reproduces the same image almost exactly, but in reverse. There are, however, a few slight differences. At the top of the drawing, the top of the socle has a different design and the swags below it are not elaborated with leaves. The second cherub in the drawing stands behind his torch, which rests on a base, while in the print the comparable figure holds a torch without a base. However, in the drawing, the body of the cherub can be seen through the base and stem of the torch, suggesting that the elimination of them might be indicated here by the draughtsman. The capitals in the engraving are somewhat elaborated. At the bottom of the drawing, the end plinths have perpendicular outer faces, while they are shallowly curved in the engraving, changed by the engraver, it would seem, to match the profile of the entablature above. Furthermore, in the print, the top of the altar table is the same at both ends, while in the drawing it is partly cut back at the left. What the engraver has done here is merely regularize the two sides of the drawing, where alternative designs are presented. The other changes in the print are very slight elaborations or reductions, which can be understood fairly easily as the result of Alberti’s interpretations of the drawing. Eliminating one section of the socle above could have been made to reduce the height of the structure so that it would fit into Alberti’s overall design for his print, with the setting for the missing statue placed within an architectural frame of piers supporting an arch. The height of the available copper plate might also account for this slight adjustment. The figure of Charity surmounting the altar in the engraving needs to be considered an original part of Rosso’s conception of this architectural and sculptural ensemble.1 A socle requires something to support and the figure of Charity is conspicuously absent from the group of Virtues that appear below as caryatids. Furthermore, the style of the other group in the print is easily related to that of Rosso’s women and children in his Allegory of the Virgin of 1529 (Fig.D.33Aa) and in his Mars and Venus of 1530 (Fig.D.42a). It must also be concluded that the top of the sheet is cut and that originally it was not arched. Alberti’s piers and arch that frame the altar stylistically bear no relation to the altar structure itself.2 Also an addition is the figure of Christ in the center; the cross that Christ holds and the shadow of the chalice at his feet overlap the niche in which the figure is placed in areas where the drawing shows no such details. However, this figure with its cross and chalice is derived from a late French work by Rosso that is known from a print (Fig.E.156) and its copies. The two groups of putti on the front of the altar are borrowed from an engraving of the Nymph of Fontainebleau by Milan and Boyvin (Fig.E.103). These borrowings by Alberti support the information of his inscription on the engraving that gives the basic design of the print to Rosso (on this and the other inscriptions on the print, see E.4a). 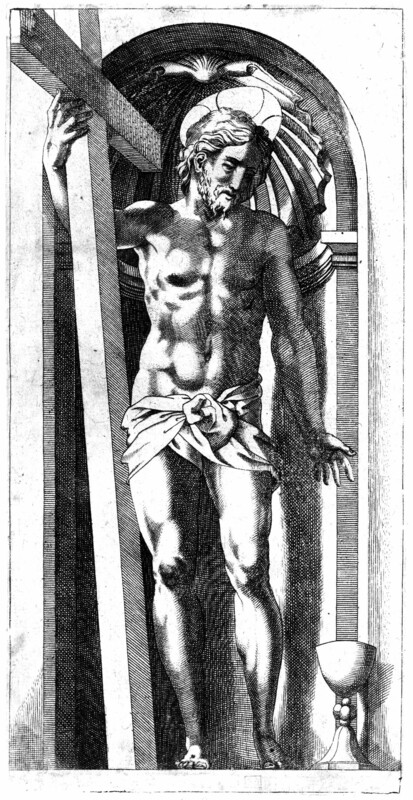 As in Alberti’s print, the drawing shows immediately beneath the plinths on which the front caryatids stand the upper surface of an altar table. Assuming that this surface would be about one meter from the floor, the British Museum drawing represents a very large structure, approximately 5.5 meters high. With the statue of Charity above, the structure would have to be 5.5 to 7 meters high, to which would have been added the height of the altar itself and that of any steps on which the altar would be raised. The front of the altar table and the steps may have originally been in the drawing, as they are in Rosso’s Design for a Chapel (Fig.D.37a), with the front of the altar undecorated. The altar would have been about the same size as the chapel. 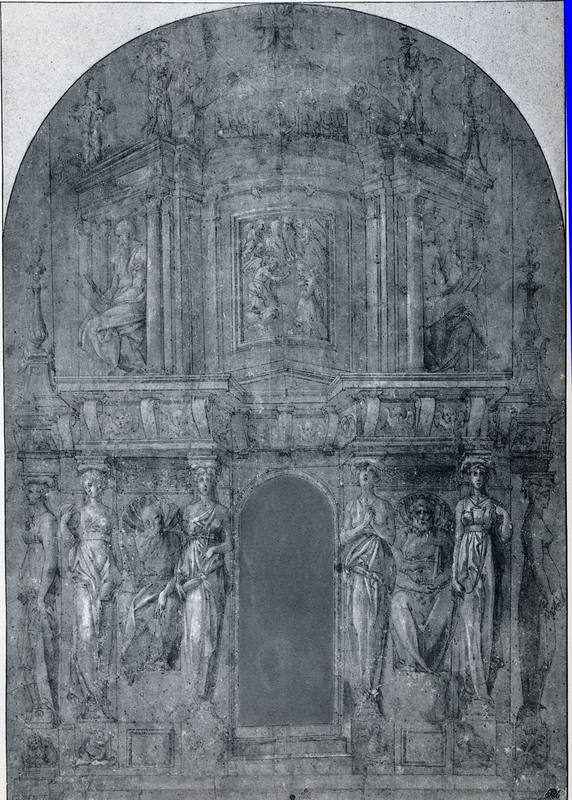 As a design for an altar rather than a small tabernacle, the central arched area in the drawing would most likely not have been fitted with a door, but would have enclosed a niche, as shown in Alberti’s print, or a painting. 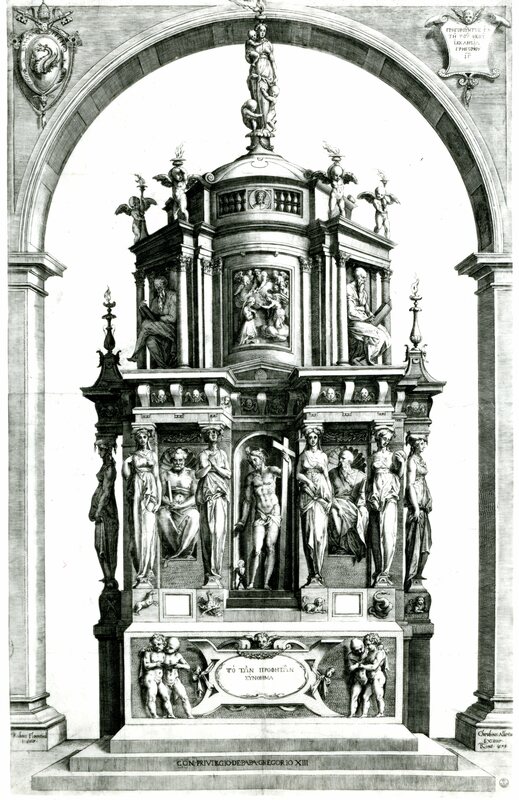 However, the depiction of steps leading up to this area and the boldly sculptural design of the whole altar suggest that the lower center part was a niche for a statue, as Alberti understood, but not for the one shown in the engraving. 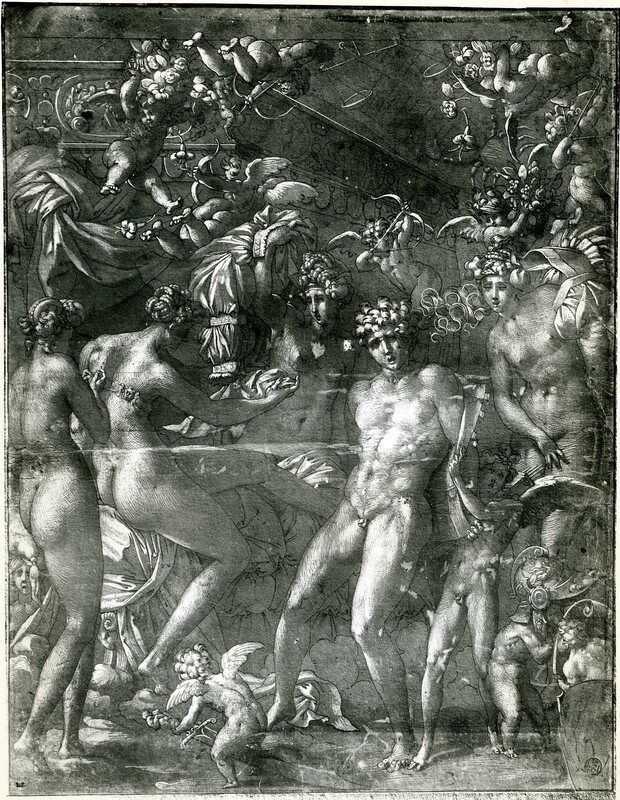 The best preserved passages of this very badly damaged drawing reveal a draughtsmanship of deftly drawn pen lines and surely applied washes that is similar to the handling of Rosso’s Mars and Venus of 1530 (Fig.D.42a), although the latter, made for King Francis I, is more painstakingly executed. Were the altar drawing not in such poor condition, the handling of it would probably be overall quite like that of the skillfully, if not exquisitely, executed Design for a Chapel of 1528-1529. The Design for an Altar is not superbly executed and the drawing of some details is less precise than one might expect from Rosso’s finest drawings. Nevertheless, the draughtsmanship of it does not reveal the hand of a copyist as does the very conscientious draughtsmanship of the Aretine Madonna della Misericordia in the Louvre (Fig.D.35 Copy, Paris, color). 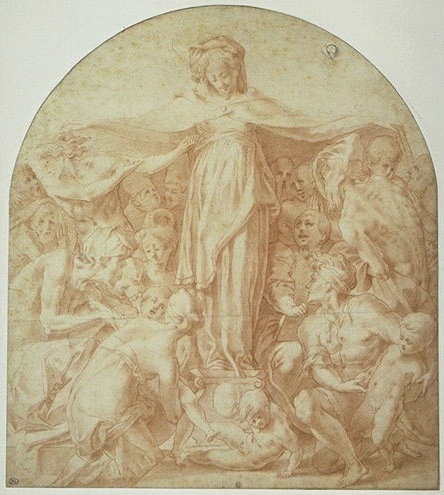 Consequently, it is more likely that the Design for an Altar is an autograph work rather than a copy of a lost drawing by Rosso. As will be indicated below, the date of the drawing is very much dependent on what one supposes was the statue that was to occupy the central niche. It is odd that Alberti did not include it in his engraving and odd, too, that the section of the drawing where the statue would be has been cut out (by Alberti?). It could be thought that the statue was not by Rosso and that Alberti, wishing the entire image that he engraved to be by Rosso, replaced this statue with another after a design by the latter, as he also added after Rosso’s design the singing boys on the front of the altar. It might in addition be thought that the removed statue had a particular and local meaning in Arezzo that Alberti considered inappropriate for a print made in Rome for the Roman market and for distribution elsewhere. The statue was probably not one in Rome. At the same time, the fact that Alberti engraved this altar suggests, as Borea (1980, 251) indicated, that it was designed by Rosso in Italy, as is true of the other three compositions by Rosso that Alberti engraved (see E.1-3). These latter designs all date from between mid-1527 and 1529, within the period after Rosso fled Rome and before he went to France. There is, therefore, good reason to look for a date for the Design for an Altar within this same period. It is most likely that the altar was designed by Rosso for the church of S. Maria delle Lagrime in Arezzo to house its miraculous image of the weeping Madonna.3 On 29 September 1528, the Compagnia of the Madonna delle Lagrime decided to ask Andrea Sansovino to design an altar for its statue which was to be moved from the old oratory to the newly constructed church (Corradini, 1960, 124, and Franklin, 1994, 253-254, 294, n. 96-99, for this and other information below).4 On 15 October, the Compagnia decided not to move the statue and then on 25 November agreed to have an altar designed for the oratory (see also Azzi, 1931, 40), but the artist is not specified. Vasari (1568, II, 122; Vasari-Milanesi, IV, 522) mentions that Sansovino made a drawing for an “ornamento” for this church with four figures, each four braccia high, but that this project was never realized because of Sansovino’s death, which occurred in March or April 1529. It seems unlikely that Sansovino did anything as the result of the Compagnia’s decision of 29 September 1528, which was abandoned on 15 October 1528, perhaps only days after Sansovino would have learned of the earlier decision. The project Vasari records must be the one related to the decision of 25 November, the day after Rosso was commissioned to do a series of frescoes for this church (see D.31-34). With statues four braccia high, Sansovino’s project would have been one of considerable size. The miraculous statue, a polychrome terracotta image of the Madonna and Child made about 1430 by Michele da Firenze, is approximately 1.50 meters high and is now placed above the high altar of the church in a large structure designed for it around 1600.5 Prior to its placement there, the statue seems to have been on an inconspicuous altar, perhaps the original one that Sansovino was to replace.6 In Rosso’s drawing, the niche can be calculated to be about 1.60 meters high, just the right size to contain the miraculous statue, the very closed composition of which would have been completely contained within the limits of the niche. Iconographically, all of the parts of Rosso’s altar, including the missing figure of Charity above, support the probability that the central image of the structure was the Madonna and Child. One should also note that prior to the miracle of the weeping statue in 1490, the church (then a small oratory), the beginning of the new and very much larger construction of which dates from that year, was called, as it is today, SS. Annunziata. 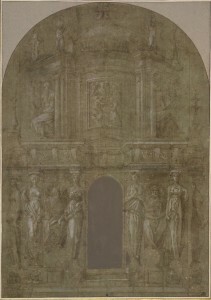 Above the niche in Rosso’s drawing is a relief of the Annunciation. Although I formerly thought that this drawing was done at the very beginning of Rosso’s French period, further evidence given above makes it most likely that it was done within the year before he left Italy. On stylistic grounds there is no reason why this should not be the case, even though architecturally the altar most resembles what appears in some of Rosso’s Fontainebleau frescoes. One has merely to believe that the architecture of the altar anticipates the buildings in the French pictures and that the architecture in the latter is not dependent on anything especially new that Rosso learned in France. Vasari (1568, II, 209; Vasari-Milanesi, V, 165) tells us that Rosso made drawings for “fabriche” in and around Arezzo and we also know that while there he owned a copy of Vitruvius’ treatise on architecture (see DOC.13). 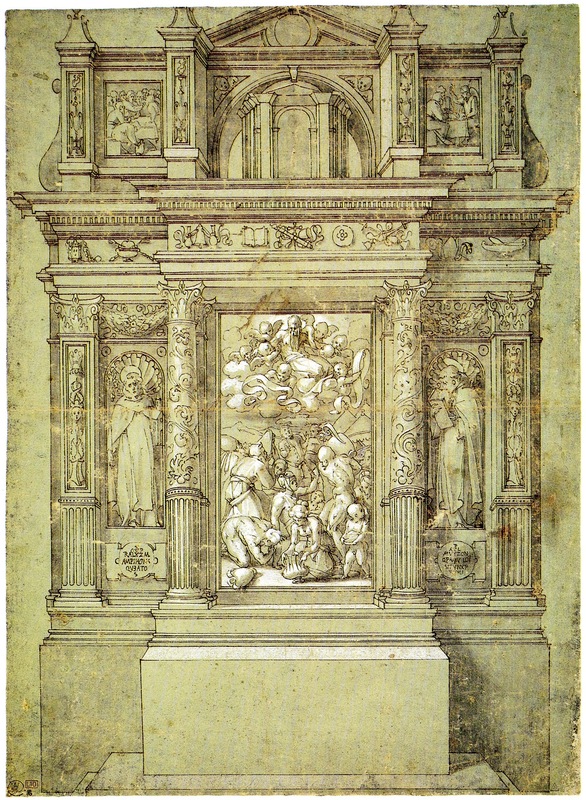 Rosso seems to have made an intensive study of architecture at this time, perhaps in anticipation of the career he would have in France, and this study may well account for the difference between the architecture of the Design for a Chapel of 1528-1529 (Fig.D.37a) and that of the Design for an Altar. The use of caryatids may well be dependent upon Rosso’s study of Vitruvius and his discussion of them in the first book of The Ten Books on Architecture, with illustrations in Renaissance editions. What does appear certain is that the architecture of the altar is more sophisticated and inventive than that of the chapel and hence that the altar is a later work. Béguin’s opinion that the design was made in France is dependent upon the placement of Charity at the top of the monument, a virtue important to Francis I, and on Alberti’s use of the two prints of French images by Rosso to complete Rosso’s scheme for his engraving of 1575. However, the interest in Charity on the part of the King that she brings forth belongs to 1517 (see also Lecoq, 1987, 384-386, and Béguin, Paragone, 1989, 8-14), more than a decade before Rosso would have made his drawing in Arezzo. Furthermore, Rosso designed his monumental altar to contain all seven virtues, of which one had to be placed in a central position. And as Béguin said herself, Charity is the “vertu qui contient toutes les autres.” Hence, its placement on top of the altar appears easily justified. As to the use of the French prints: there were no Italian printed images that would have served Alberti’s purpose. If the drawing were made in France, it is surprising that it was not engraved by an engraver working there, such as Milan or Boyvin. The decision by the Compagnia on 29 September 1528 to have Sansovino design a new altar for its statue seems to be related to the assumption that this statue would be moved from its location in the oratory to the high altar of the newly constructed church. But when it was decided on 15 October of the same year not to move the statue from the oratory, the decision on 25 November 1528 to have an altar built was for one to be erected in that oratory itself. 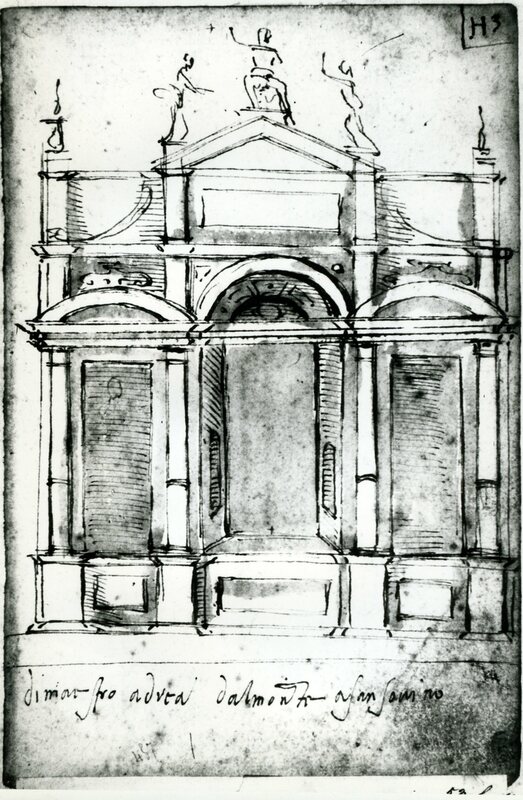 Sansovino’s design for this altar may be preserved in a drawing in Lille (Fig.Sansovino, Lille).7 Rosso’s drawing would seem to have been done for an altar to be situated in the same location.8 It was probably done after Sansovino died at the end of March or the beginning of April 1529. As Rosso fled Arezzo in early September 1529, and at that time abandoned his fresco project for S. Maria delle Lagrime (see D.31-34), the Design for an Altar must have been done before that time. COPY, PRINT: Cherubino Alberti, E.4 (Fig.E.4). Engraving. 1 The Charity in Alberti’s engraving is related to a drawing in Edinburgh (Fig.Edinburgh, D826), National Gallery of Scotland, no. D826. Pen and brown ink, 17.3 x 7.1; faintly inscribed in darker brown ink at the bottom: rosso. PROVENANCE: Davis Laing; The Royal Scottish Academy. LITERATURE: Carroll, 1966, 173, n. 22, as reflecting Rosso’s draughtsmanship but certainly not autograph. Andrews, 1968, I, 110-111, II, Fig. 753, as a copy after Rosso. Béguin, 1988 (1989), 12, Fig. 7, as a copy after Rosso perhaps by Léonard Thiry. Franklin, 1994, 254, as a copy recording the figure of Charity at the top of Rosso’s altar. This drawing shows the group in reverse of what appears in the print, indicating that the former was not copied from the latter. But the socle in the drawing is as it appears in the print and not as in the British Museum drawing, although the swags are simplified as in the latter. The penmanship of the drawing vaguely suggests that it may have been copied from a drawing by Rosso that would most likely also have had washes and possibly white heightening. However, that drawing would not have been from what has been cut from the top of the British Museum drawing unless it was the draughtsman of the Edinburgh drawing who eliminated the missing section of the socle. In this case, the drawing may go back to Alberti’s shop. An alternative conclusion is that the print is actually based on another version of the British Museum drawing in which the socle had its slightly different design and in which also other small differences, as noted above in the print, may have appeared. The other version could have been a disegno di stampa especially made by Alberti or by someone in his shop from which the engraved plate was actually made. Béguin’s suggestion that the Edinburgh drawing may be by Thiry does not seem acceptable on the basis of what we know of this artist (see now especially Brugerolles and Guillet, 1994, 92-129). The attribution to Thiry would also seem dependent on Rosso’s drawing having been done in France, which I think is not the case. Béguin also thought (1988 , 12, and Fig. 8 ) that the drawing was similar to the Virgin and Child by Geoffrey Dumonstier but in its actual details this is not true. 2 They are also not related to the architecture of the church of S. Maria delle Lagrime in Arezzo, in the oratory of which (see below) this altar would most probably have been built. Nevertheless, Alberti’s framing of the altar with architecture may indicate that he had some idea of the intended location of the altar. 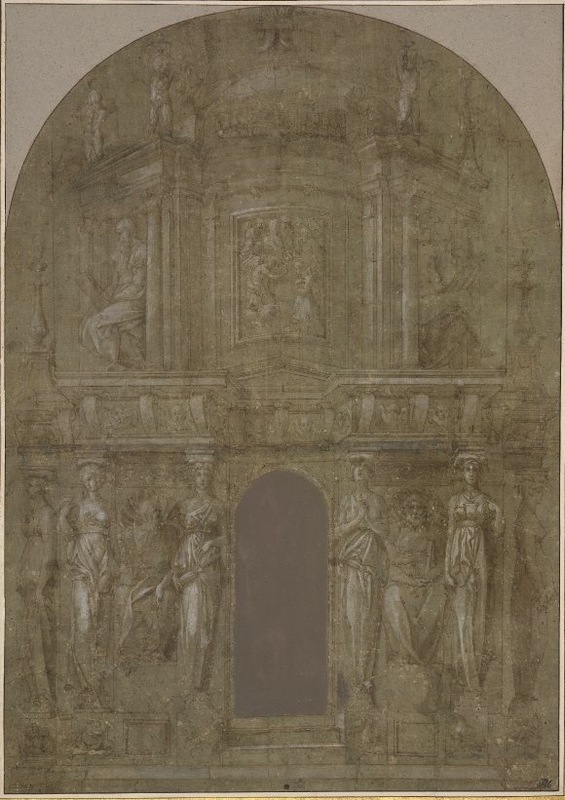 The cutting of the top of Rosso’s drawing into an arch may have been determined by the example of Alberti’s print. 3 See Dezzi Bardeschi, 1964, 59, 97, n. 22. 4 See also Silvano Pieri, “La Compagnia della SS. Annunziata dal XIV al XVIII Secolo,” Annunziata Arezzo, 1990 (1993), 26, 27, Fig. 1, 31, 46-51. 5 On this statue, see Mario Salmi, “La Madonna delle Lacrime di Arezzo,” Rassegna d’Arte, XV, 1915, 263-264; Giuseppe Fiocco, “Michele da Firenze,” Dedalo, XII, 7 July 1932, 542-563; Mario Salmi, Onoranze a Guido d’Arezzo. Mostra d’Arte Sacra della Diocesi e delle Provincia dal Sec. XI al XVIII, exh. cat., Arezzo, 1950, 19-20, no. 26. The high altar was designed by Ridolfo Sirigatti and apparently executed in 1601 (Thieme-Becker, XXXI, 1937, 102; but Dragoni, 1759, 44, says the altar was begun in 1591 and finished at the end of 1599 on the design of Bernardo Sirigatti). Photographs of this altar are found in Venturi, XI, I, 1938, 477, Fig. 436, and in Dezzi Bardeschi, 1964, 58, 62, 68, and 71. 6 Dragoni, 1759, 44, said that before its placement on the high altar, the statue was also moved earlier because “il posto del suo antico altare, per esser rimasto nel fondo, ed in un canto della chiesa, parea non molto decoroso.” From this remark, made over 150 years after the statue was moved, it is not possible to tell where precisely the statue had been – if, in fact, Dragoni really knew. But it would have been in the atrium of the church that was built on the site of the old oratory (see Coradini, 1960, 117, and Dezzi Bardeschi, 1964, 63-65, 74, on the original location of the Trecento oratory at the right end of the atrium that replaced it, behind its still existing façade). The location of the altar in the atrium is also indicated by frequent references to it in relation to Marcillat’s round window of the Marriage of the Virgin, which is in the wall at the far right end of the atrium (see Silvano Pieri, “La Compagnia della SS. Annunziata dal XVI al VII Secolo,” in Annunziata Arezzo, 1990 , 48; and Giovanna Virde, “Le Vetrate della Chiesa della SS. Annunziata in Arezzo,” in Annunziata Arezzo, 1990 , 192-194, and n. 87). 7 Lille, Musée Wicar, no. 53v, B457, Pl. 798. Pen and ink and wash, 21 x 14; inscribed in ink across the bottom: di maestro adrea dalmonte a San Savino; in the upper right corner in ink: H3; at the lower left, in pencil: 457. From a photograph, the drawing appears to be a page from a notebook. The drawing has been related to the Lagrime altar by Luigi Grassi (see D.37, n. 1). Vasari stated that Sansovino’s project had four statues, each four braccia high. The drawing shows a central niche which would have been for the miraculous image, and areas at left and right which could be for statues but, shaded as they are, could have been filled with paintings. Above are sketches for three large statues; at the ends are sculpted torches. 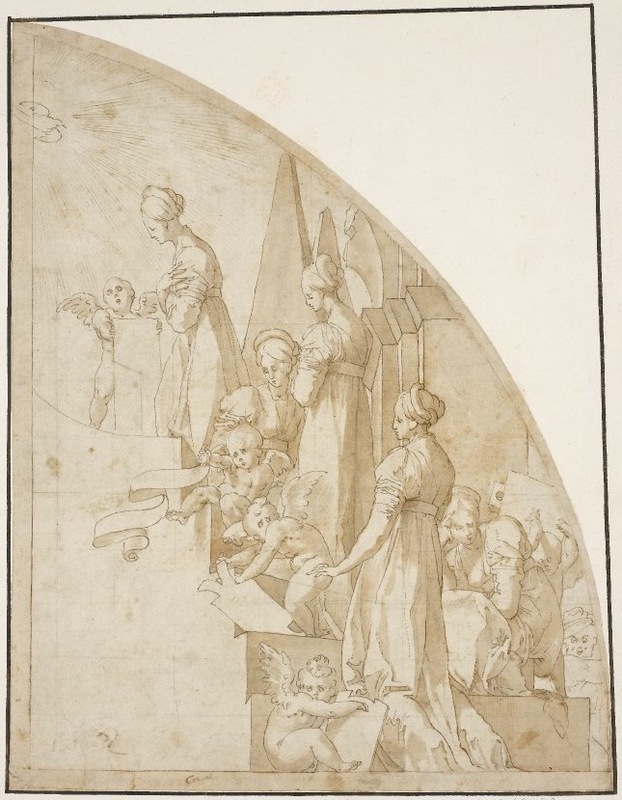 If this drawing is for the Lagrime altar then Vasari was wrong in saying it had four figures by Sansovino. Franklin, 1994, 294, thinks Grassi was wrong. 8 On the identification of this location with the atrium of the church, see n. 6. If the altar that Rosso designed was not for the high altar because the Compagnia wanted to keep its statue at the location where the oratory had been, then perhaps the altar was meant for the left end wall of the atrium where there is now a door. Still, the high altar is more possible and the Compagnia could have changed its mind again. It was for the upper walls of the central bay of this atrium that Rosso was commissioned to do a series of frescoes on 24 November 1528 and all the documents referring to Rosso, and to Soggi, concerning the frescoes locate them as above the altar of the Madonna delle Lagrime, which must, then, have been in the new atrium and apparently in the present center bay of it (see Preface to and D.31-34). The iconography of the altar is compatible with and does not duplicate that of these frescoes.